The liberalization of French long distance transport is offering new opportunities for coach operators. 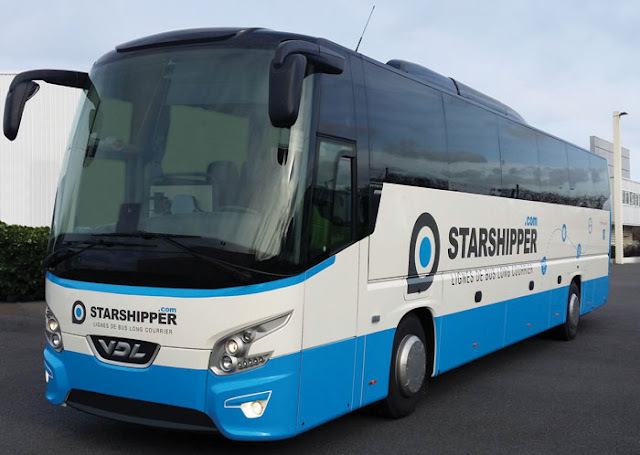 At the end of 2015 10 VDL Futuras were delivered to the French passenger transport companies that operate under the Starshipper brand. In the first four months of 2016 VDL Bus & Coach will deliver an additional 11 Futuras for use with Starshipper. All the coaches are branded in the Starshipper house style colours. The 21 VDL coaches currently or soon to be in service for Starshipper are Futura FHD2-129/440's. At the end of 2015 VDL Bus & Coach delivered three Futuras to Le Groupe ASTT (Aquitaine Service Transport Tourism), two to Autocars Jollivet and five more for companies Cars de l’Élorn, Autocars Le Meur, Autocars Le Roux, L’Été Évasion and Autocars Jézéquel. These ten Futuras with a length of 12.9 metres have a 48+1+1 seating plan and are luxuriously appointed with features that include comfortable seats, Wi-Fi, 220 volt socket at all seats, a defibrillator and/or a wheelchair lift. By the end of April 2016 eleven more deluxe Futuras will have been shipped to various customers, including two for Autocars Nombalais, one for Autocars Jollivet and one for Hervé. VDL also welcomes 6 new customers, who will receive one Futura each. These six vehicles are going to Autocars Rouillard, Farouault, Bellier, Robert, Bihan and Cars des Abers. The 21st Futura will be delivered to Pullman D'Aquitaine in April. Starshipper is one of the five players involved in the opening-up of the market for long-distance coaches. The marque is operated by independent SMEs active in passenger transport in France.